As another sign of the changing landscape in the U.S. space program, NASA's long-time space shuttle launch director has joined United Launch Alliance to lead the commercial firm's human spaceflight operations. 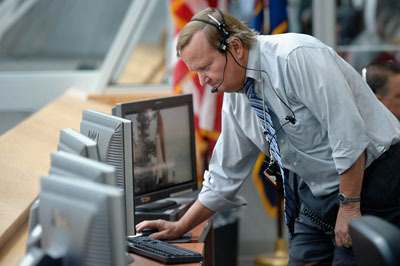 Mike Leinbach presided over the final space shuttle missions as the launch director from his perch on the top row of Firing Room 4 in the Complex 39 launch control center, giving astronaut crews his signature sendoff of "good luck, Godspeed and have a little fun up there." But once the winged spaceships finished flying last summer, the future of human space missions by the U.S. have been stalled while waiting for development of commercial replacements. United Launch Alliance, which was formed in December 2006 to blend Lockheed Martin's Atlas 5 and Boeing's Delta 4 rocket programs into a collaborative organization for the Air Force's Evolved Expendable Launch Vehicle program, is vying to be the rocket-maker of choice for carrying future piloted craft. The Atlas 5 has been picked by Boeing's CST-100 capsule, Sierra Nevada's Dream Chaser mini-spaceplane and Blue Origin's vehicle, which represent three of the three competitors in NASA's commercial crew launch program. SpaceX plans to use its own Falcon 9 booster for the Dragon capsule. "With ULA having been selected as the launch vehicle of choice for three of the four Commercial Crew Development companies, Mike's expertise in human launch systems provides a strong synergy in bringing together two world-class launch cultures," said Jerry Jamison, ULA's vice president of launch operations. In addition to the commercial efforts using Atlas 5, Lockheed Martin's work to develop the Orion deep-space capsule to take humans beyond low-Earth-orbit will undergo an initial flight test atop ULA's Delta 4-Heavy rocket in 2014. "We are fortunate to have Mike with his wealth of human spaceflight experience join the ULA team," said George Sowers, ULA's vice president of Business Development. "His background in leading overall space shuttle launch activities for more than a decade, executing 37 space shuttle launches, will be invaluable as we develop human spaceflight capabilities for our Atlas and Delta systems." A native of Reading, Pa., Leinbach graduated with a Bachelor of Science in Architecture in 1976 and a Master of Engineering in Civil Engineering with emphasis in structural dynamics in 1981 from the University of Virginia, Charlottesville. He began his NASA career in 1984 as a structural engineer in the design engineering directorate and served as a lead design engineer for a variety of launch pad systems including the orbiter weather protection and emergency egress slide wire systems. He advanced to the role of NASA test director in 1988 to direct daily operations at Launch Complex 39. In 1991, he was named shuttle test director, conducting the terminal countdown and launch of 17 missions. A stint in the late 1990s then saw him serve the deputy director of the space station hardware integration office to oversee processing at KSC and integrated testing of the station elements before assembly in orbit. Then came the role that Leinbach is most remembered for, becoming the space shuttle launch director in August 2000 as the person to give the final "go" for liftoff at T-minus 9 minutes. Leinbach and his wife Charlotte reside in Scottsmoor, Fla.
After the final shuttle landed in July, Leinbach told reporters: "There are four phases of change, right? And it doesn't matter what the change is, any major change in one's life you go through these four stages -- it's denial, anger, exploration and acceptance," he said. "We've all been through that now in the shuttle program and we've accepted the fact that it's over. This is the end of the program, and people will move on and do well. ... It's important, but it's not the end of the world. The sun will rise again tomorrow."